I'm usually not one to watch much TV, unless we're talking about Cubs baseball, of course. However, Food Network is a pretty popular channel in our household and as long as my fiancee keeps finding tasty recipes from that source, I'll be a-okay with that. Hosted by Steve from the always entertaining blog, The Card Chop, instead of whipping up a quick recipe from a set of mystery ingredients, Steve competes to build a trade package to meet my approval. A new card of Goose Gossage sporting the Cubbie Blue pinstripes? A short-term stop card of a future Hall of Famer is an awfully good way to start off the competition; it celebrates the recording of Gossage's milestone 300th save, which was recorded in a Cubs uniform. 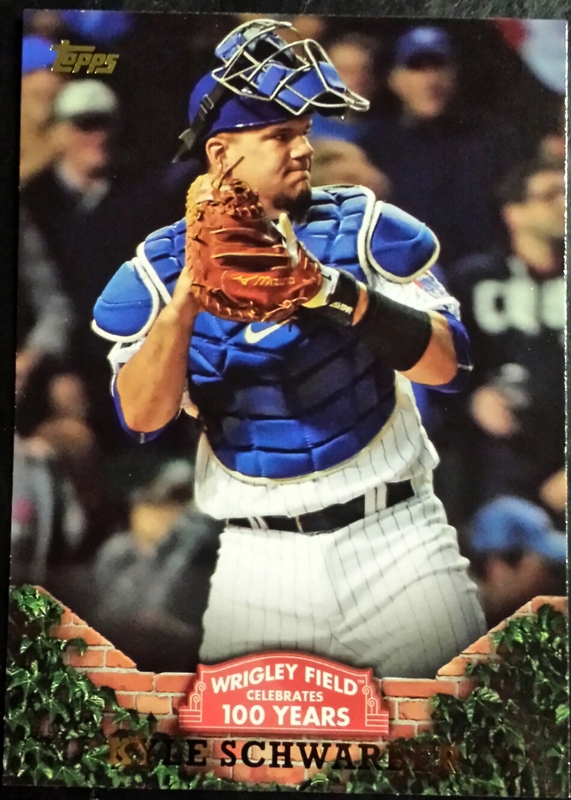 I love the design of this insert set; I truly feel that the ivy and brick motiff is symbolic of baseball in it's purest form and it's about time there was a set that used these features prominently in it's design. 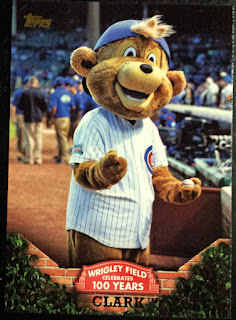 Not to mention, an all-Cubs themed insert checklist is always going to catch my interest. Oh hey, another Hall of Fame closer; although, Brucie is associated with the Cubs franchise much more deeply than Goose. Right before the Wrigley family foolishly allowed the split-finger master walk away in free agency, he won the 1979 Cy Young Award for the Northsiders, a fact that this card notates. Two Hall of Famers in two cards, Steve is off to a roaring start. Alright - my all-time favorite player is always a good idea to include if you're looking to earn my thumbs up. Gracie was the true mark of consistency throughout my childhood, leading baseball in hits for the 1990's. Before that, his 1989 NLCS performance was otherwordly - batting an eye-popping .647 and garnering half of the RBI's scored by the club. Unfortunately, Will Clark and his Giants were even better; but, that doesn't mean his video game-like numbers don't deserve some recognition in this set. Teammates with Gracie on that '89 NL East Championship club, Awesome Dawson struggled through injuries and ineffectiveness in the playoffs. However, that's not why he was included in this checklist. Now, if Schwar-bomb doesn't match those numbers put up by the "Hawk" in 1987, he'll be a total disappointment. Don't worry, that's sarcasm, I'm not one of THOSE kind of fans. Schwarber does have some phenomenal potential, as we saw with his two-HR, game winning performance in Cincy and his scoreboard tater in the Cardinals playoff series. So much potential, that Topps decided that his home debut was worth including in a set that is supposed to cover 100 years. Speaking of the fact that this set is supposed to cover a large amount of historical ground, here's the oldest subject found in this particular envelope (and maybe the whole checklist, I can't quite remember). William Wrigley kicked off one of the most famous family ownerships in professional sports when he became the majority shareholder of the franchise in 1921. This Wrigley is credited with helping to inject new life into a then-listless team by hiring baseball men such as Bill Veeck and taking a hands-off approach to ownership. It was his son, P.K., who cared little about baseball and ran the team into the ground (think College of Coaches and financial stinginess). 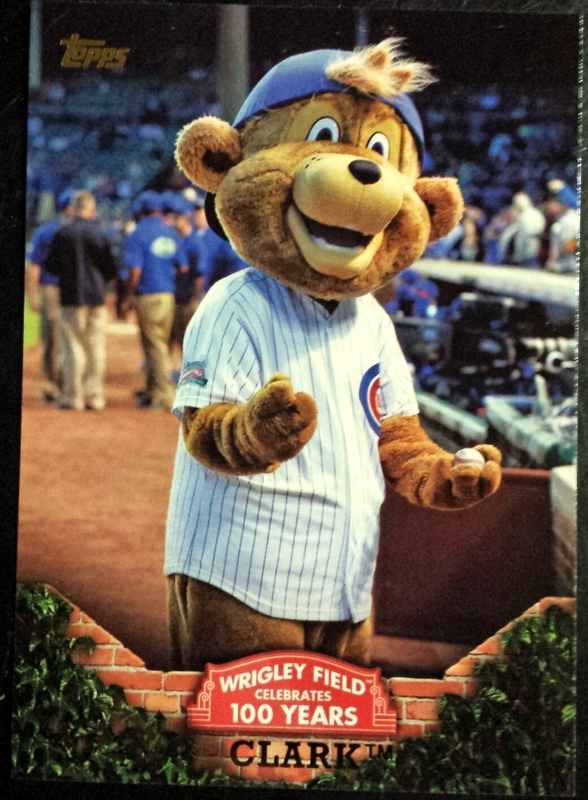 With such an iconic name attached to an iconic franchise, I'm sort of surprised this is my first baseball card of any of the Wrigley family. I guess ownership doesn't get a lot of cardboard love overall though. Okay - I don't think the Cubs getting a mascot is notable enough to warrant his inclusion in the set, unless you're talking about the media firestorm his pants-less wardrobing caused (including the accidental airing of an anatomically-correct parody drawing by a major news network). Even still, it's an odd choice by Topps. 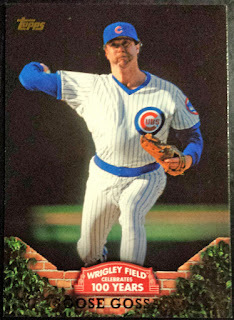 Still, I do believe this is Clark's first appearance on a baseball card; so, that's actually pretty nifty. With that, we've reached the end of Steve's PWE. How'd he do? Judges? Well, Steve included a substantial portion of my favorite insert set from this year's Flagship project, which carries a design I've long desired to see used on cardboard. As part of that, he included my favorite Cubs player of all-time, my first card of my favorite team's most famous owner, Clark the Cub's "rookie card" and a Kyle Shwarber to boot. On the negative side, the history purportedly covered by this set was largely ignored, instead mostly focusing on including the usual "modern" suspects and big names. It sure would have been nice if Topps actually included some more moments from Wrigley's earlier years, like Gabby Hartnett's "Homer in the Gloamin'" or the Hippo Vaughn/Fred Toney dualing no-hitter. However, that's hardly Steve's fault - that's totally on Topps for being kinda lazy. 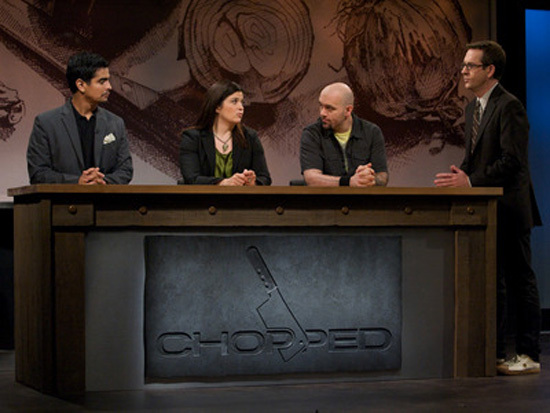 So, all that considered, the judges all came to conclusion that Steve more than made the chop. This was an excellent trade package that provided some pretty cool new cards for my collection. Thank you so very much for reaching out to me, Steve! You'll have a nice stash of Braves cards heading out in the mail on Monday. Thanks for tuning in to Wrigley Roster Jenga today! 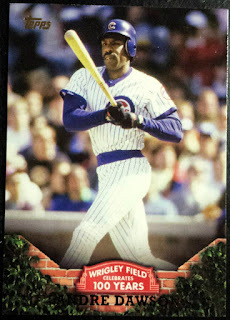 I'm not buying any packs but I have considered buying a set of the Wrigley cards. I don't really care for Clark but he's not aimed at my demographic anyway. How about a Santo heel click card? Nice dig this set, I sent you a couple more recently if there dupes send them on to another Cubbie collector for me. Glad to hear that I passed the test! Looking forward to some cards and future deals! I love the design of this insert set, but some of the choices Topps made in deciding what got into the set aren't as great. I pulled a Wrigley card that commemorates Cole Hamels's no-hitter from last season from a pack a few days ago. ?? ?